In the plastic injection moulding industry, a hot runner system is commonly used to reduce production cost and improving product quality. There are many advantages of using a hot runner system; for example, saving resin materials, shortening cycle time, reducing stress and saving energy. Based on the design of nozzles, there are two types of hot runner systems: open gate system and valve gate system. An open gate system is where melted plastic is injected into the mold cavity directly, leaving some tiny marks on the molded part. In a valve gate system, a valve pin is used to control the hot runner nozzle to open and close so that the melted plastic will not be stringing and drooling at the tip. Valve gate hot runner systems include two main types, individual stem actuation and plate actuation. Both have their own advantages and disadvantages. The valve gate hot runner system with individual stem actuation is mainly for large part designs since it is a simple and cost-effective method that can easily integrate with the mould. The valve gate hot runner system with plate actuation can guarantee all valve pin actions exactly at the same time and are suitable for high cavitation applications. At the mould design stage, one of the most important design decisions is about the hot runner system. How to quickly evaluate different options mentioned above and figure out the most cost-effective solution is a challenge for the mold-makers and moulders. For the above mentioned issues, CAE simulation enables users to predict and evaluate the pros and cons of the effects and then determine a suitable hot runner system design for manufacturing needs with scientific methods. Moldex3D enables engineers to individually specify each nozzle with open gates or valve gates in a multi-drop hot runner system. 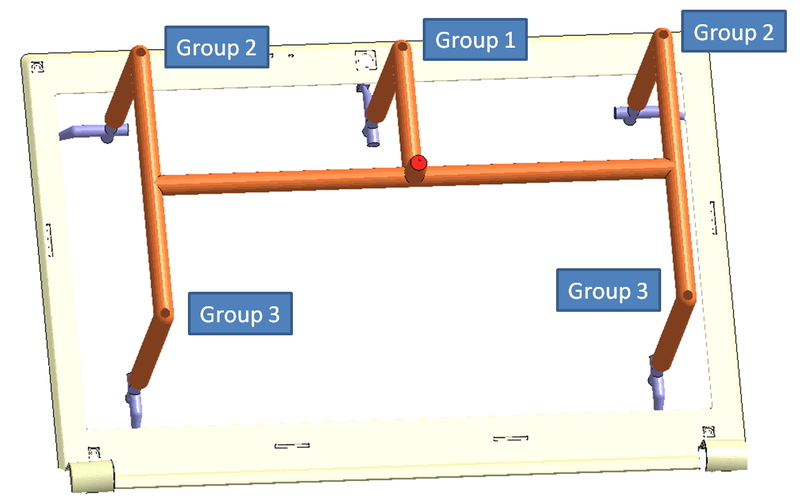 Grouping during valve gate assignment allows users to control valve gate actions of multiple drops simultaneously and efficiently when they are specifying and modifying the process conditions. 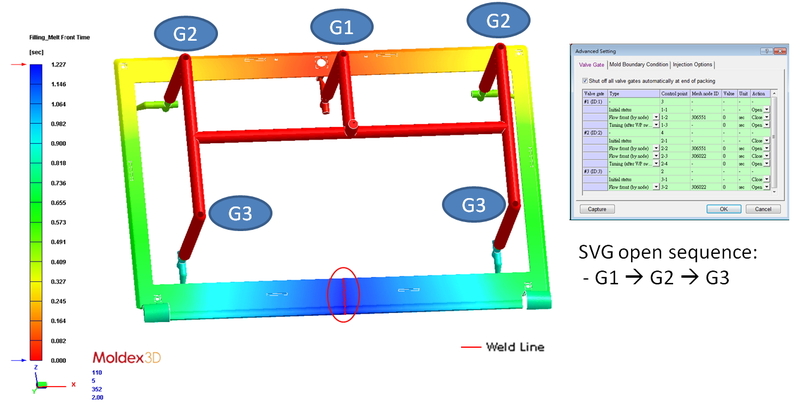 Moldex3D provides complete and flexible parameter setting in valve gate controls. Primarily, the valve gate initial status in each valve gate group can be set to open or close. For each valve gate group, multiple control points can be set according to custom moulding process needs and from there, provide six different types of trigger option to switch the valve gate status during filling and packing stages. Second, in a same valve gate group, it allows mixing types of each control options and points for various and advanced requirements. Furthermore, all valve gates in default will shut off automatically at end of packing to behave as in most realistic cases. The following example shows an LCD monitor cover with a 5-drop hot nozzle design. A Valve gate hot runner system is adopted in this case and sequential valve gate control will be applied to the molding condition to eliminating weld lines. The five nozzles are organized into 3 groups (Fig. 1). The Process Wizard in Moldex3D has 6 control type options available for each valve gate group. Fig. 2 shows these 6 options: Timing, Flow front (by node), Fill volume, Timing (after V/P switch), Flow front (by hot runner tip) and Ram position. All options can be mixed so users are able to specify the desired parameter as needed. According to the requirement of sequential valve gate (SVG) control, the open sequence is in order from G1, G2 to G3 and the weld line can be eliminated successfully (Fig. 3). The initial valve gate status is open in Group1 and closed in Group 2 & 3. Group1 switches to close when the flow front reaches the node which is also specified for gate opening for Group 2. When Group 3 opens, Group 2 switches to close simultaneously. Lastly, Group 1 & 2 switch to open again when the filling process reaches V/P switch point to provide packing effect into the mold cavity to compensate the shrinkage. After running flow analysis, users are able to get the valve gate open time setting and use this as their reference during a mold trial. A proper hot runner design is the key element to successfully produce a good quality plastic injection molding part with minimized cost. It is vital and the most efficient method for finding a proper hot runner design by using CAE simulation tools like Moldex3D. With complete and flexible true 3D solutions, various hot runner technologies can be properly simulated, such as sequential valve gate control, valve pin movement control, and co-injection hot runner nozzle. Depending on different product specifications and requirements, the optimization for nozzle type, runner layout, action sequence, process can be approached upfront before building the physical mould and hot runner system. To talk to one of our account managers about how Moldex3D can benefit you, call 0161 474 6886.